Spring break is just around the corner. On "The Early Show," David Gregg, senior editor of BehindtheBuy.com, shared hottest new gadgets any spring breaker -- or former ones for that matter --would love to stuff into their luggage. The following product descriptions were prepared using information provided by the manufacturers. Hit the beach and bring the tunes! 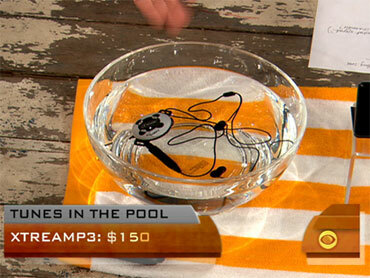 A waterproof MP3 player with armband for extreme sports. If your life keeps you constantly on the move, the FLO TV Handheld Television will help you to stay up-to-date with your favorite TV programs. FLO TV uses a unique tuner to operate off a dedicated, nationwide, live mobile TV network, so you can enjoy 24/7 access to live sports, breaking news and even great kids' programming. The 3.5" touch LCD screen makes changing channels as simple as a swipe of your finger. Plus, it comes with a 6-month FLO TV programming subscription, so you can start viewing your favorite shows on the go right away! The new KODAK PLAYSPORT Video Camera is a rugged, durable and pocket HD video camera with an appetite for adventure. The KODAK PlaySport Video Camera is waterproof up to 10 feet and features built-in software and USB cable output so users can edit and easily share with family and friends through sites such as YouTube and Facebook. The iH13 is a portable trendy water-resistant sport case speaker fits into anyone's lifestyle. Securely holds your iPod in a lightweight zippered case so taking it with you to the beach, picnic or party is a breeze. Also charges the iPod (with optional AC charger) and incorporates a full function built-in remote control, so you can use your iPod while it's fully protected in your sports case. An ultra-portable sound generator for bike, ski and skate helmets.